The Scottish terrier was developed in Scotland, they are brave, playful and muscular. they can be a very good dog for the right family. This breed has a bold and dignified personality. They are very conserved, they do not get along with every one easily. This breed is basically known to watch their surroundings before they make any decisions. They are a very intelligent breed, and like to be independent. This breed can go anywhere and have the ability to do anything. They do not do good with other pets and cats, they are a very good watchdog and will not bark with out any reason. They are good with children and older people. This breed of dogs generally has two coats the undercoat provides protection from bad weather and is soft, dense and close, whereas the outer coat is hard wiry and grows about two inches in length. 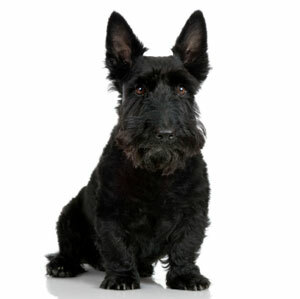 The Scottie is most often black in color, but the coat may also be brindle, gray, sandy, and wheaten. They are never white. This breed of dog require early socialization and obedience training. Training should be given to them with fairness and patience. They are good learner, they will not respond to hard and harsh methods of training. Training should be given consistently, they do well if they are trained well. This breed of dogs likes adventure, they need long walks and jogging they does not do well in warm climates, they love to play with their masters and family. Scottish Terrier do well in apartments if they are provided sufficient exercise. This breed of dog requires brushing twice in a week to avoid dirt and dead hair. Bathing should be given to them when it is needed. The Scottish terrier dog breed like other dog breeds is prone to some breed specific dog diseases and health problems they may suffer from cataracts, hypothyroidism, and Von Willebrand Disease. This breed is especially sensitive to fleas and many have skin diseases.